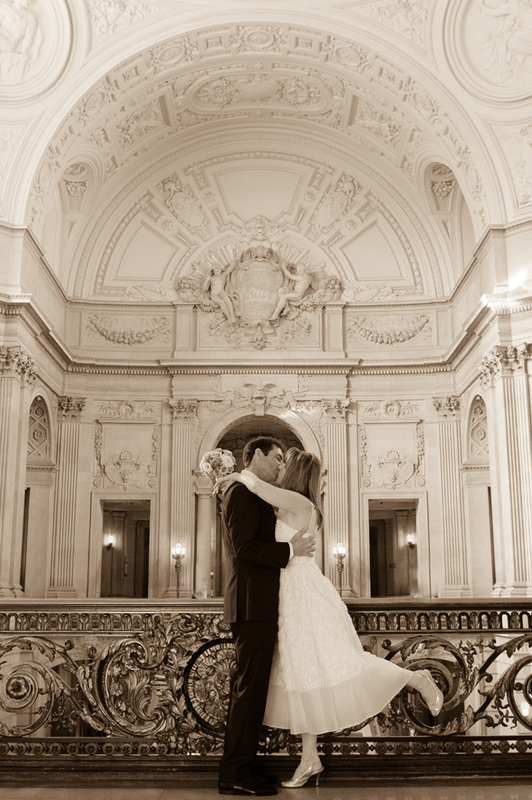 San Francisco City Hall Weddings are a great value! Where else can you have access to an amazingly beautiful Wedding Venue for under $100? Yes, it is true! It only costs $83 to have your wedding in the Rotunda area in city hall and the County Clerk even provides a free Wedding Officiant to perform your ceremony. They call these officiants Deputy Marriage Commissioners and they dress up in robes and look like judges. The fact that they are all volunteers is unknown to many, but it is part of the reason that you can get married in this building for such a great price. Many of the other venues available throughout San Francisco can cost thousands of dollars and still do not match the beauty of City Hall. The obvious downside of City Hall weddings is that you have to share the building with the general public, but even this is not such a terrible thing. In this wedding photographer’s opinion, it can be part of the fun. 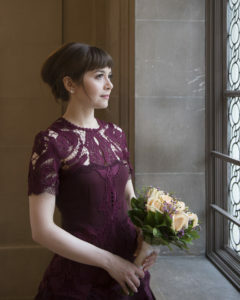 The only problem comes when City Hall schedules a special event on your wedding day. This is rare and the building is so large, you can go to other places and still have a nice wedding ceremony even if a large event is set for your day. A big part of the expense of any San Francisco wedding is the reception. When you book a wedding you generally need a venue that can supply you with both a place to get married and also somewhere to eat. The exception to this is if you get married in a church. Obviously, if you are planning on a church wedding, this article doesn’t apply. 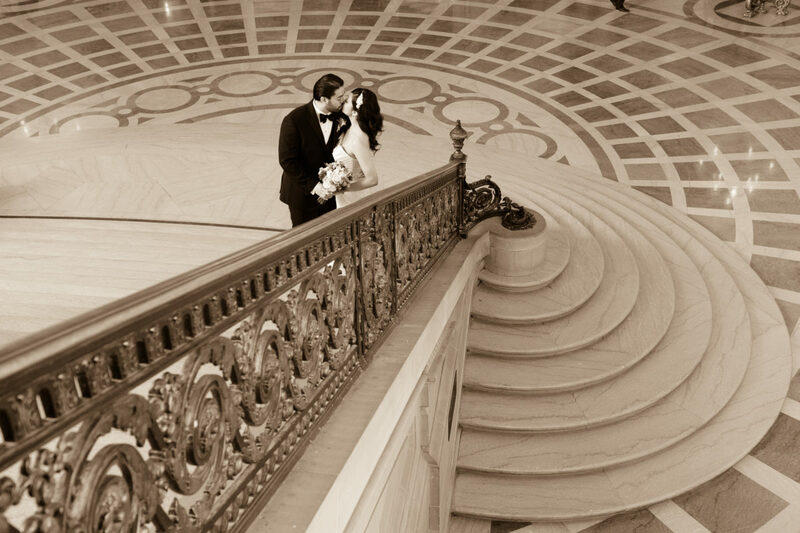 What many of our City Hall clients like to do is schedule their city hall nuptials in the Rotunda and then book us for wedding photography after. Meanwhile, their guests gather at one of the many nearby restaurants that specialize in city hall wedding receptions. There are many fantastic places to celebrate and all our walking distance away from San Francisco city hall. We have mentioned these eateries in other blog posts, please refer to Places to Eat Near City Hall for more details. This is one of the key features of city hall wedding affordability. One of the major expenses of any wedding is the professional wedding photographer. 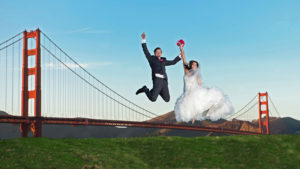 The best photographers in San Francisco can run anywhere from $2,000 up to $6,000 for full wedding coverage. These same wedding photographers offer their services to City Hall brides and groom for a fraction of this cost. 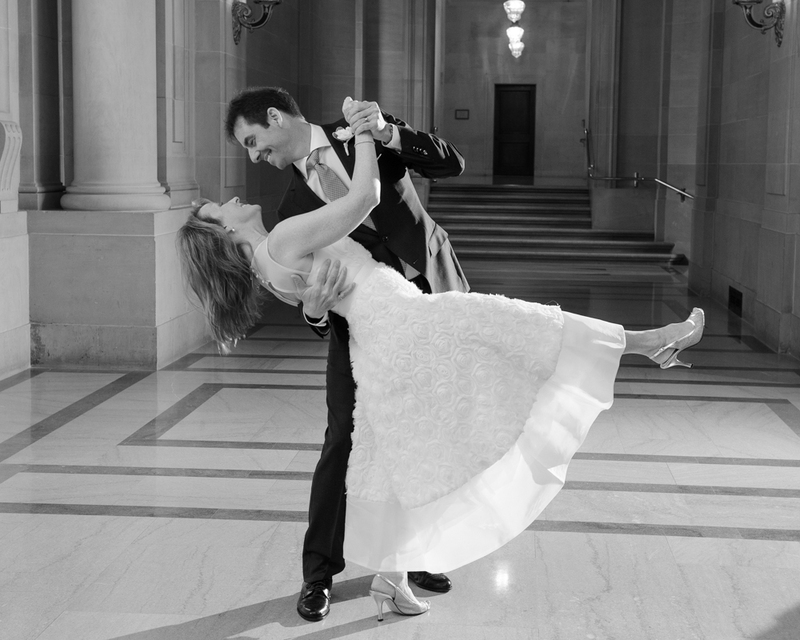 Many San Francisco City Hall photographers have discount pricing that starts at $500. Yes, you are only getting them for an hour or 2, but that is really all you need. The most experienced professionals will take you on a tour of the building and follow that up with the chance to be driven around San Francisco for more photos. A fantastic opportunity to work with some of the most accomplished wedding photographers in the Bay Area at this very picturesque venue! Here are a few samples of the types of photos you can get at this amazing venue. 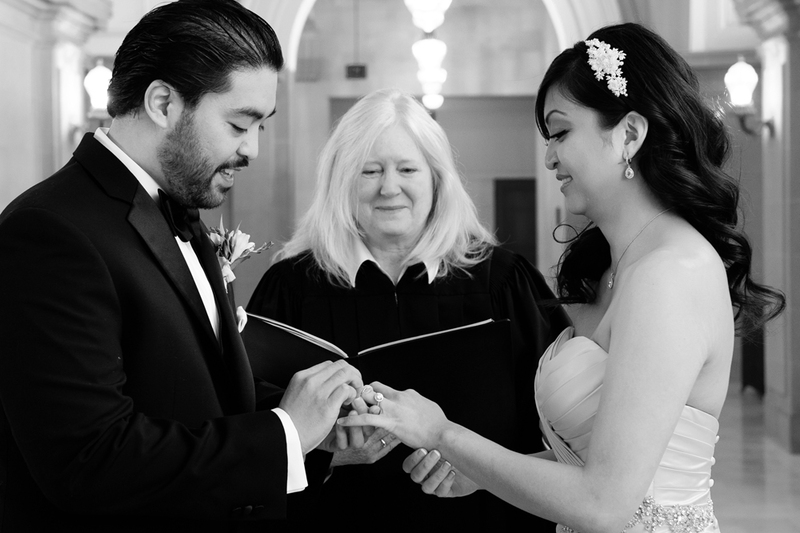 The month of January is always our slowest time period for city hall weddings. It’s in the middle of the winter and there is no special event or holiday in January. December of course is always busy due to the Beautiful Christmas tree and brides and grooms just like to get married at that time of the season. February features Valentine’s Day and we always have weddings right around this date. 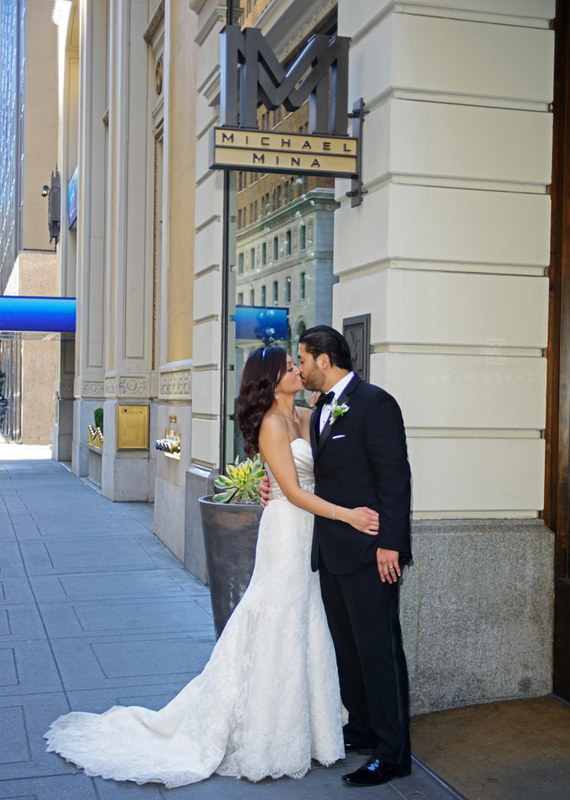 Many engaged couples actually choose to have their nuptials on this romantic holiday! 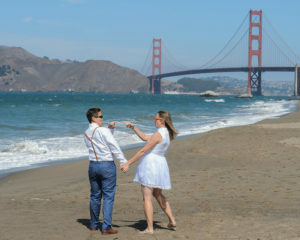 Given this slight lull, I thought it would be helpful to take the time to discuss some of our favorite destinations in San Francisco that we take our city hall wedding couples. This is by far the most popular wedding photography destination. Especially chosen frequently by our international brides and grooms. It has a very large area for wedding photography with lots of options. 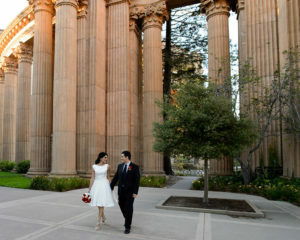 The beautiful building is obviously the centerpiece, but there are large columns everywhere to use as a backdrop. The only negative is the amount of tourists here. Depending upon the time of day, it can be hard to find space without people looming in the background. Another popular wedding photography spot, but fortunately MUCH less traveled by tourists. The Legion of Honor offers beautiful Beaux-Arts style architecture which many of San Francisco’s older buildings possess. We love taking our city hall brides and grooms around the inner open area and pose them between the gray repeating columns. The light is also fantastic here from a wedding photography standpoint. This is because you have indirect light that comes in from the side, but is also reflected by the neutral tones of the building. Perfect for a rainy day as well! This completes part one of our San Francisco City Hall wedding photo destination options. We will be adding more locations next week, please stay tuned! We love all of our brides and grooms and always make sure we work to get great images of all of them. However, every once in a while we are lucky enough to book a couple that are naturals. This particular couple included a groom who had taken Ball Room dancing lessons and a bride who was a Ballerina. 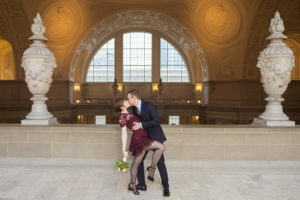 We had a fantastic time with them at San Francisco City Hall with them booking our City Hall PLUS package which provided them with 2 hours of coverage including the ceremony and family photos. Once the ceremony took place in the Rotunda we photographed a few images of their family and friends. The family members were all amazing and absolutely supportive of us and our wedding photography efforts. 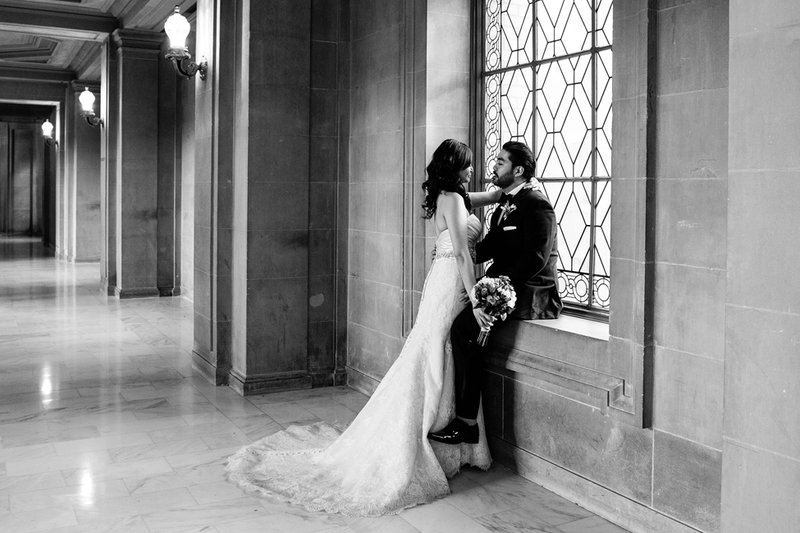 We spent some time talking to them and discussing some of the finer points of City Hall weddings and then we took the bride and groom around the building for their photo tour. We visited every single floor of City Hall starting with the Grand Staircase and then up to the 2nd Floor to get some shots in the hallway. We knew we had to make sure we took them up to the 3rd floor to take advantage of the beautiful window light so we headed there next. Here is one of our window shots! We also needed to include some romantic wedding photos to show the close connection between the bride and groom. This kind of posing is quite easy when your couple has that type of bond. 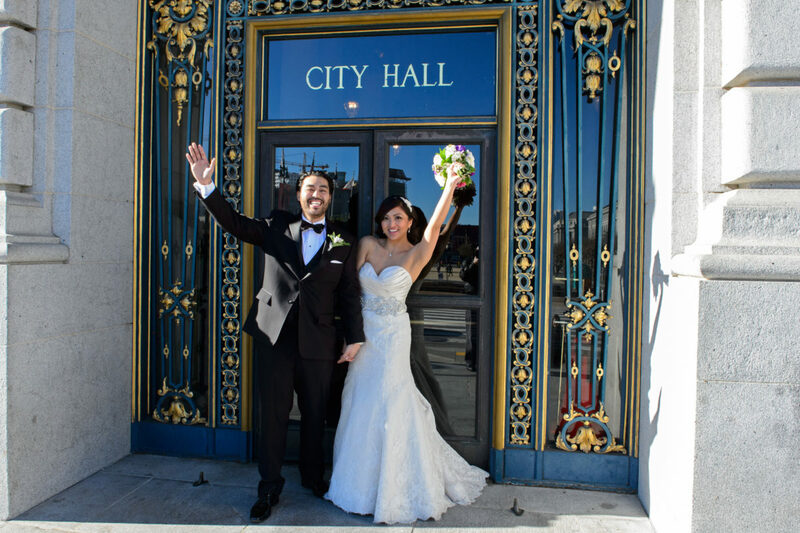 We finished up our photo shoot in typical fashion by taking the couple to the Famous City Hall sign on the Polk Street entrance to the building.